A delicious way to start your family’s day! 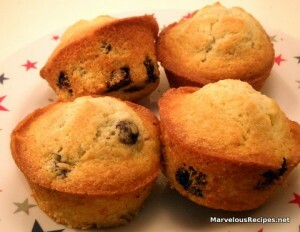 These light, fluffy blueberry muffins are always welcome at my breakfast table! 1. Preheat oven to 400 degrees F. Grease or coat with cooking spray, 15 muffin cups. 2. In a large bowl, cream together the butter and sugar until smooth. Add the egg, milk and vanilla until well blended. In a small bowl, combine the 1-3/4 cups flour, baking powder and salt; stir into the batter just until moistened. 3. Toss the blueberries with the remaining 1 tablespoon flour to coat; fold into batter. Spoon batter into muffin cups, filling about 2/3 full. 4. Bake in preheated oven for 15 minutes or until tops spring back when lightly pressed. Serve warm. Makes 15 muffins.